Putin will doubtless win the presidency again. But he faces a very different country from the one he has ruled unchallenged for the last twelve years. When Russian activists applied for a permit to stage a rally in Moscow the day after parliamentary elections on December 4 they expected about 500 people to attend. 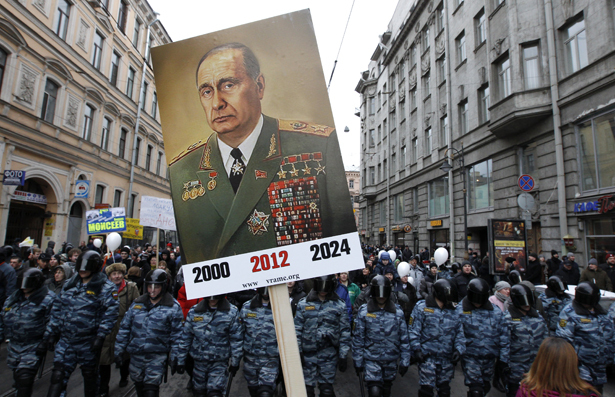 Widespread allegations of electoral fraud and a growing sense of disillusionment with the ruling party and Vladimir Putin, however, inspired more than 5,000 people to take to the streets. “It was as much a surprise for the organizers of that particular rally as it was for the Kremlin,” says Tanya Lokshina, Deputy Director of Human Rights Watch in Moscow. Five days later more than 50,000 Muscovites took part in a second rally. Even larger protests were held on December 24 and February 4. Last Sunday, in what was perhaps the most ambitious action yet, some 35,000 protesters formed a human chain along Moscow’s ten-mile Garden Ring Road, which encircles the city center. Many of the participants brought their children as well as candy, tea and cigarettes to share, white carnations and balloons, and even their white pets—cats and dogs—white being the symbol of peaceful protest. Which is part of the paradox of Sunday’s presidential elections. Though many are demanding fundamental changes to the political process—free and fair elections, fewer obstacles to registering political parties, and the direct election of regional governors, to name just a few—when voters go to the polls they will be reminded of just how carefully managed Russia’s democracy is. Other than Putin himself the usual suspects—Communist Party leader Gennady Zyuganov, Liberal Democratic Party showman Vladimir Zhirinovsky and Sergei Mironov of the loyal Just Russia Party—are all running in what has become a kind of photo op for the Kremlin (the list of candidates looks pretty much like it has for every electoral cycle since 2000). The only outlier is billionaire oligarch Mikhail Prokhorov who has exhibited an independent streak in recent months but is better known for his close ties to the Kremlin. He now faces a much different country than the one he has ruled virtually unchallenged for the last twelve years. Indeed after just three months of sustained protest the conversation in Moscow has shifted from one of how long Putin will reign—he could conceivably stay in office until 2024—to how long he’ll be able to hold on to power. But that doesn’t make the opposition’s task any easier. In an e-mail, Ilya Faybisovich, one of the young organizers of the December protests, said that the post election strategy remains somewhat vague. Some of the more prominent leaders have called for the formation of a “mega-party” capable of incorporating the diverse interests of the opposition movement, from nationalists and liberal democrats, to communists and the so called non-political, under a single umbrella—one that could challenge United Russia and field its own candidate in a future presidential election. But this is not without its own risks. According to Lokshina such a party could play into the hands of the Kremlin, especially if the various factions are unable to maintain a unified front. Despite the fact that Putin is expected to win here on Sunday, the election will play an important role in shaping the opposition as it moves into an uncertain future. In a way it already has. Since parliamentary elections in December tens of thousands of Russian citizens have registered to serve as election monitors, an unprecedented outpouring of civic engagement. (Alexey Navalny, the popular anti-corruption blogger launched a web site to recruit presidential election monitors, RosVybory, that already has more than 16,000 registrants.) Their efforts will also make it far more difficult for the Putin administration to claim that foreign interests and non-Russian NGOs are fabricating allegations of vote fraud. “When it’s genuine local Russians it’s much harder to dismiss their criticism,” says Wilson. Putin himself has promised to install web cameras in each of the country’s 91,000 polling stations. But this will do little to stop local and regional officials from simply fudging vote totals, what may have been the most widespread form of vote fraud in December. This could set off a new wave of protests. And if they do move it up a notch, whether by occupying public space or continuing the kinds of successful street protests of the last few months, the big question is how the Putin regime, once reinstalled in the Kremlin, will respond. The honest answer is no one knows. It is hard to imagine the Putin administration putting up with any kind of occupation of public space for very long. The Kremlin, rather flat footed at first in its response to the protesters, has sent somewhat mixed signals in recent weeks. On the one hand they’ve allowed the massive protests to continue and though the police presence has been heavy they have clearly taken a soft approach (much credit is due to the non-violent tactics of the protesters themselves). On the other hand there are signs that this openness may be coming to an end. Several media outlets critical of the Kremlin have come under fire; slander campaigns against opposition figures have escalated; and activists have been subjected to the usual drumbeat of threatening phone calls, intimidation, and harassment. The movement’s very strength and its ability to withstand the mounting pressure of the state may lie in its multiplicity of voices—the fact that it cannot be pigeonholed into standing for a single idea or behind a single leader. Yaroslav Nikitenko, an environmental activist who has been involved in the campaign to save an old-growth forest outside of Moscow as well as recent protests, wrote in an e-mail that a lot of the people attending the demonstrations are not there because they support some sort of abstract “movement.” “The basis of the protest is not for something,” he wrote, “but against the current totally corrupt and illegitimate system.” This explains in part the movement’s broad based appeal as well as the focus on free and fair elections (it operates under the banner, “For Honest Elections”) and opening up of the political process. Beyond the push for a level electoral playing field, however, the coalition’s demands and vision are far from unified. Large questions loom chief among them the role of far-right nationalist groups in any sort of reform movement. Alexey Navalny, one of the group’s more prominent leaders whose fight against corruption has earned him a wide following, has openly embraced anti-immigrant nationalist rhetoric (a position he has held throughout his political career). Though he claims to believe in a kind of benign nationalism many on the left are uneasy about where this might lead. “It is a difficulty for many intellectuals and liberals—these sort of independent democrats who support him as an anti-corruption figure but do not support him as a nationalist,” says Maxim Trudolubov, opinion page editor of the business daily Vedomosti. In addition, though corruption has been an easy target to organize against, the protesters haven’t really put forward an economic vision that challenges the neoliberal orthodoxy of the Yeltsin and Putin years. One exception is the Left Front, whose de facto leader, Sergei Udaltsov, has emerged as an outspoken organizer of the recent protests. Udaltsov secured the permit for the December 5 demonstration and has called for more radical measures—including unsanctioned rallies—if the administration doesn’t meet the protesters’ demands. Though focusing more recently on political and electoral reform Left Front has also pushed for the inclusion of economic and social justice—nationalization of strategic industries and a tax overhaul—in any sort of reform effort. It isn’t clear whether Left Front’s endorsement of Communist Party candidate Zyuganov in Sunday’s election is a temporary alliance or a long-term political strategy. Perhaps it reflects more the fluidity and openness of Russia’s rapidly changing political landscape. Not unlike the Occupy movement here in the United States the nature of the protests as well as the messy and often fractious debates among members of the informal organizing committee (Orgkomitet), seem to be giving birth to new possibilities. For now the mood is one of cautious optimism even in the face of at least another six-year term for Vladimir Putin. “It’s really about showing the Kremlin that there is a protest potential in the country,” says Lokshina, “that there is a vibrant civil society that can make a difference and that has to be taken into account.” Whether the Kremlin chooses to listen and make good on the promises of reform it has outlined thus far will come into focus after Sunday’s vote.